When you’re out in the woods going for a camping , keeping in touch with the rest of your group is essential. At times like these, you’ll want two way radios for camping excursions.If you camp quite a bit, consider investing in a camping two-way radio with ruggedness and protection against unpleasant conditions built in; they will withstand abuse and come in very helpful when you find yourself coordinating food and calling in your family when they have been off hiking and you can get these essential gear here at Digitalnerds.net. NOAA Weather Channels – One of the more volatile aspects when you are camping out is weather. That’s why two way radios with NOAA weather channels is extremely important, especially in remote locations where there is no cell signals. Range – When you are camping ,the terrain is generally hilly and with lot of tree, not very ideal for two way communication and it is important to choose high powered model which provides more 2 miles of in the woods. Battery Life – When you are out camping, the power sources may not be available and you need to look for models with battery life and select the ones which powers up using standard AA or AAA batteries. Light Wight – Camping two way radios needs to be light weight and easily carried in your back pack along with other camping gear. When you are out in the nature enjoying a camping or hiking vacation, keeping in contact with the rest of your family or group is very important. 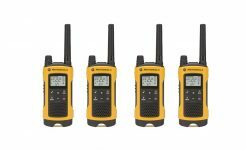 When you are going for a camping, you should be shopping for two way radio which include NOAA supported channels to stay up to date with weather patterns, kid-friendly features . 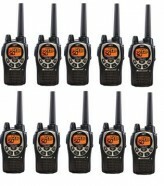 If you need help, our digitalnerds expert customer service agents can help you get the best two way radios for your needs.Digitalnerds has the largest selection of recreational two way radios well suited for Camping and keep in contact with your camping party..